📷 A framed photograph which hangs in Mike Trombley’s Veterans’ Agent office in Southbridge of the first time he met Ted Kennedy. In the tumultuous late 60s and the optimistic early 90s, Ted Kennedy’s visits to Southbridge led to unexpected interactions for Southbridge Veterans’ Agent Mike Trombley. SOUTHBRIDGE – Most people don’t meet a nationally prominent politician or celebrity once. For Southbridge Veterans’ Agent Mike Trombley, two meetings with Ted Kennedy decades apart connected Southbridge, Vietnam and Washington, D.C. in a remarkable way. Trombley grew up in Southbridge and has lived in town for most of his life, except for the period of his military service. In 1968, Trombley was a 20-year-old airman serving in South Vietnam at Tuy Hoa Air Force Base. One day during his time serving at the seaside base, he was told that he had a visitor. His military superiors didn’t tell him who the visitor was, and Trombley didn’t think much of it. Trombley was brought to a room in the “PX” building to wait for his visitor (those familiar with military life will recognize that “PX” is shorthand for “purchasing exchange” –a general store on a military base or post). Trombley had waited for a while in the room before he heard the sound of helicopters approaching to land at the base. About 20 minutes later, his surprise visitor arrived in the room; it was U.S. Senator Ted Kennedy. The senator had arrived to say hello to Trombley during a scheduled visit to South Vietnam; he was making good on a promise to Trombley’s mother back in Southbridge. Kennedy had told Trombley’s mother that he would check on her son during an upcoming trip to the war-torn country. Trombley’s parents had become friendly with Senator Kennedy through a mutual acquaintance, Doris Racicot. Racicot, a Southbridge native, was very active in the Democratic party and in women’s political groups at the time, going as far back as the late 1950s. 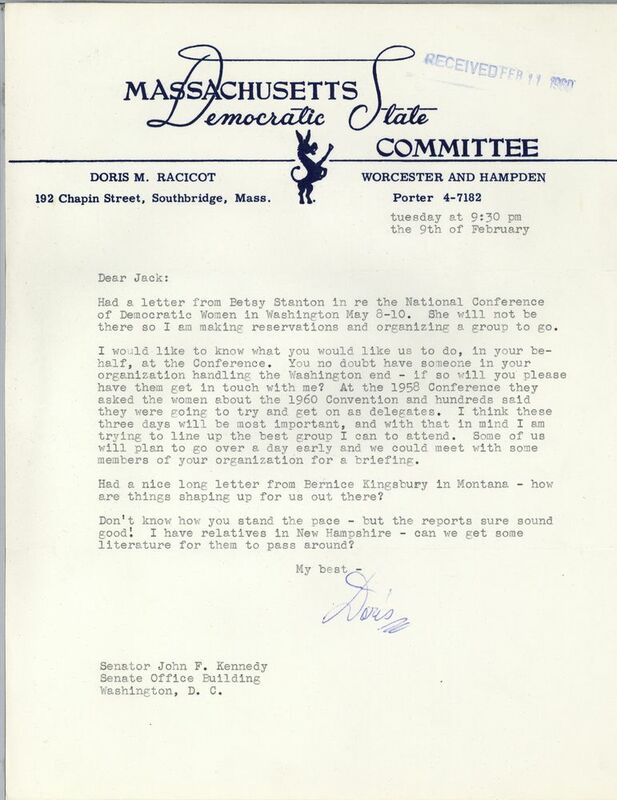 In fact, several letters that Racicot exchanged with John F. Kennedy in the early 1960s, addressing him informally as “Jack” and arranging political activities, are on file with the John F. Kennedy Presidential Museum and Library. Those letters can now be seen in the museum’s online archives. Years later, Racicot would serve as the chairwoman of the Massachusetts State Democratic Committee. A letter from Doris Racicot of Southbridge to “Jack” – otherwise known as JFK – in Feb. 1960. Courtesy John F. Kennedy Library and Museum. Kennedy had visited Southbridge not long before the trip to Vietnam in which he surprised the young airman Trombley. Although the Trombleys were not members of the Southbridge Democratic Committee, they had forged a friendly relationship with Kennedy. In a conversation with Trombley’s parents, Kennedy asked Mrs. Trombley why she had seemed to be distracted or “blue.” He must have noticed a change in demeanor from previous visits to the area. She mentioned that her son Mike was in Vietnam and they hadn’t heard from him much. Although it was not unusual to not hear from a service member deployed overseas for long periods of time, naturally as a mother she was worried and eager to hear any news that her son was safe. “I am your senator,” Kennedy replied. “I can get in anywhere to check on him for you.” Little did she know that this was not just a politician making grand promises; he would single out and greet Trombley for what seemed like a once-in-a-lifetime encounter. A military photographer caught the moment, and the young airman received a copy of the photo. His mother received some reassurance, if for a limited period of time, that her son was safe and healthy in his war service. Trombley served in the Air Force for three years, including one year and 38 days at Tuy Hoa Air Force Base. After he re-entered civilian life, he returned to Southbridge and continued on with his life. Although he kept the photo of himself with Senator Kennedy, he never saw the senator as life returned to “normal”- nor did he expect to see him again. The photograph had been printed after Kennedy’s visit to Tuy Hoa was over and so he did not have a signed copy, just the photo itself as proof of the unique visit. Twenty-four years later in 1992, Trombley had an opportunity to attend an event at the former American Optical complex in Southbridge, which would feature Ted Kennedy as a speaker. Kennedy had become involved with plans that were evolving at the time to use the former industrial complex as a Department of Defense operations site. Several people would have the opportunity to meet Kennedy, if only for a few minutes each, as they lined up to greet the prominent politician who was still a Massachusetts senator. Trombley brought the photo taken of the two in Vietnam with him to the event. He carried the photo in a folder and when he had a turn to greet the senator, Trombley asked Kennedy if he recognized him. Kennedy hesitated for a moment before Trombley pulled out the photograph to reveal the picture of them decades earlier when Trombley was 20 years old. Trombley says that Kennedy reacted with enthusiasm and surprise – and a bit of salty language that we won’t repeat here (and for which Kennedy’s wife shushed him, reminding him of the public setting). Kennedy told Trombley that he would make his way through the line and the scheduled events for the day and then he would catch up with him later to talk more. With echoes of the promise made to Trombley’s mother decades before, Kennedy caught up with the veteran by the end of the day. That framed photograph now hangs in Trombley’s office at the Southridge Community Center on Chestnut Street, where he works as the town’s Veterans’ Agent. Trombley has considered donating it to the John F. Kennedy Museum and Library but hesitates because of its local and personal value. The photo is hung in a frame on a side wall in the office. 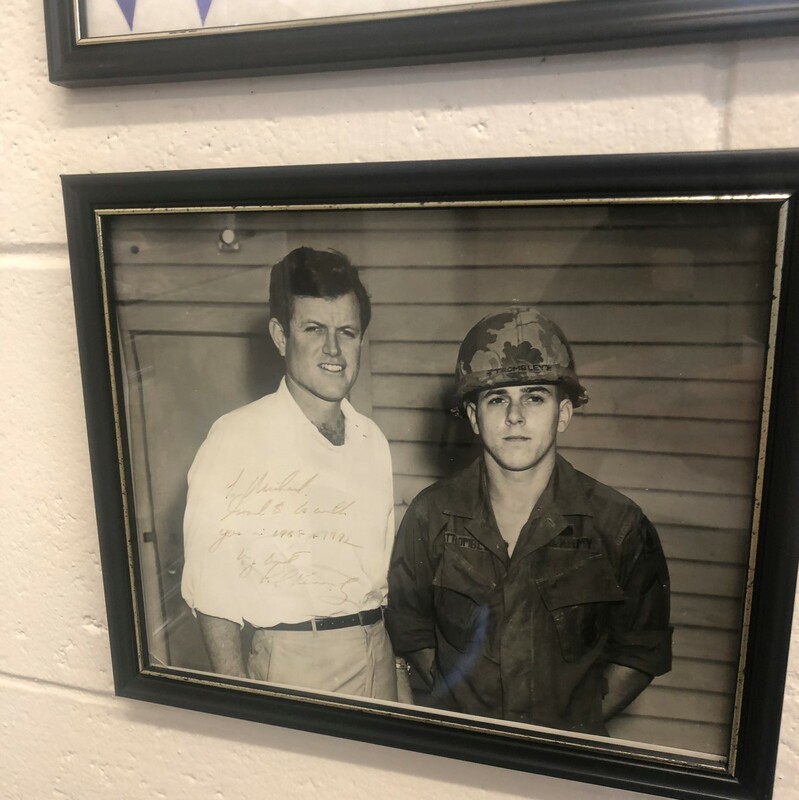 You might miss it on a trip to the office unless you look to the left and happen to get a quick glimpse of a black and white photo of two young men, one in a kevlar helmet and another whose distinctive Kennedy facial features make you do a double-take. The photo will hang in this inconspicuous corner of the veterans’ affairs office of Southbridge, at the far end of Chestnut Street in a former National Guard Armory building for as long as Trombley keeps the photo there. It’s a great conversation piece for Trombley when people notice it; it tells a story of an unexpected connection to home at a tumultuous time in American history, a time when the quicker communication we take for granted today wasn’t available. And it’s the story of a young man from Southbridge serving his country, who had two chance encounters with a member of a storied American political family.